Although Swedish Orient Line, or SOL, exists since 1911, it is only recently that the Swedish company started a liner service. In 2010, one of its five divisions –SOL Continent Line– began to operate a regular ro-ro service between Helsingborg and Travemünde. Now SOL Continent Line has expended significantly, and has become a main player in the ro-ro liner business. SOL was known for its sturdy ro-ro ships built in Japan in the late seventies. They were used on the SOL Med service. However, it took until 2010 before SOL started to operate on a short sea ro-ro liner service? We were asked to put one ship on a regular service between Travemünde and Helsingborg. This line was started as a reaction on the steep price increases from the other operators. After this we started on the very competitive Finland – Germany trade, between Hanko en Rostock. We decided to withdraw when the competition became too fierce. In the meanwhile we already had a very good customer, StoraEnso, for whom we did the ship operation management. We operated their ships for them. With such a customer, becoming a liner company was something natural. Could you explain the main strategy of SOL Continent Line? Our baseline is simple: Cargo is King. It is the cargo that decides what we have to do, which ships we have to use, which frequency is needed etc. It is up to us to offer our customers cost-efficient transport solutions. Because, if you don’t, you’re simply not in business. Offering cost efficient transport solutions is the key element. I would also want to add that we have a strategy not to compete with our customers with door-to-door service, as more or less all competitors do. What ships do you use? VINTERLAND and the three sisters we acquired from Transatlantic, TAVASTLAND, TUNDRALAND and THULELAND. These three vessels were purpose-built for StoraEnso, and have the highest iceclass 1A+. Ideal for operations in the Baltic and the Gulf of Botnia. Then we also charter a couple of ships: the BALTICA (from Godby Shipping), SCHIEBORG and SLINGEBORG (from Wagenborg) and the brand new Visentini-owned ML FREYJA which we subcharter from Mann Lines until Christmas. After Christmas, which ship will replace ML FREYJA? This is something I don’t want to reveal yet. How do you see the ro-ro vessel market as it is now? Ro-ro is an extremely small segment in the shipping industry. It is a pool of 120 to 130 ships, with almost no new ships until now. As soon as there is one vessel too much for the market, rates go down. And if there is a shortage, prices go up. What we observe now is the arrival of big ships, like the ones from DFDS and CLdN. Big ships have the advantage of a lower cost per freight unit if you fill them. However, you also need frequency. SOL Continent Lines has grown considerably. Basically you started as a one-route operator between Finland and Germany and now you are a well-established ro-ro company, with a considerable network. Tell us more about this network of routes. We have four routes. 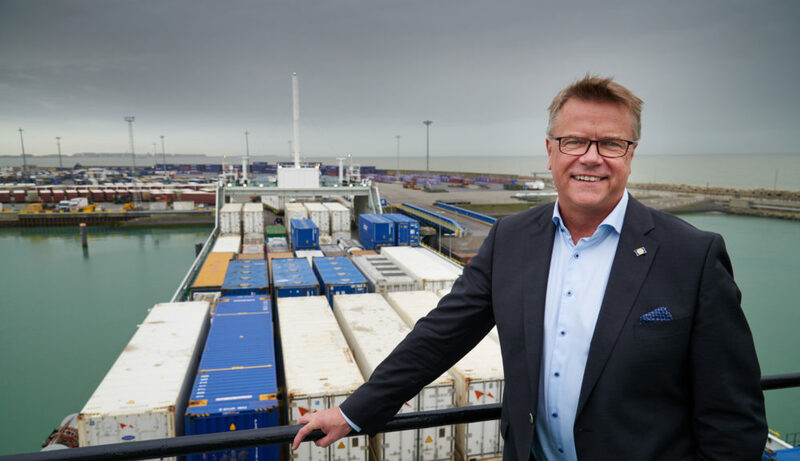 The backbone of our services is the connection between Gothenburg and Zeebrugge. The major raison-d’être for this route is the cargo from StoraEnso. This cargo is being shipped in SECU containers, on vessels that are chartered to StoraEnso. Our task is to sell the remaining freight capacity, either the empty space on board, or the empty space in the SECUs. In filling the return capacity in SECUs we work in cooperation with Scanroad, a privately owned transport company with locations in Sweden, Belgium, France and Finland. Scanroad ships approximately 7,000 units a year with SOL. Up to 40 SECUs per week are being filled with cargo that comes via Scanroad. Doesn’t that mean a higher cost because of the extra handling? No, because trailers are being used more efficiently, instead of being on a ship for 34 hours. For example, a Scanroad driver brings the trailer from the north of France to Zeebrugge, and on the PSA Terminal the cargo is transshipped into the Secus. Almost immediately the driver can return with the trailer to where he comes from. Also important is the fact that with a payload of 90 tons one Secu can ‘handle’ three trailers. (Of course the cubic meters are a factor too). We also have to look at the efficient use of truck drivers. It seems we are getting a shortage of drivers. You are operating four ships on Zeebrugge – Gothenburg. The ML FREYJA, the TAVASTLAND, and the two Wagenborg sisters SCHIEBORG and SLINGEBORG, which were built for this route, together with SPAARNEBORG. Why don’t you have the SPAARNEBORG in your fleet? Before us, it was CLdN/Cobelfret operating the three ships on this route. In December 2014 they decided to go their own way on Zeebrugge – Gothenburg, and we were asked by StoraEnso to take over the route, which we did. But in the short transition period of end 2014, SPAARNEBORG was sold to Cobelfret. Four ships instead of two or three. That can only mean a booming traffic? Yes, when we compare the first nine months of this year with last year we see a steep increase of volumes of 92%. Also, all departures have a good utilization level, often above the 90%. Between 2015 and now we saw an increase of 233%. Logic if you know that in the beginning there were four sailing as week, against seven to nine now. StoraEnso is of course the biggest shipper on Zeebrugge – Gothenburg and that brings stability. At the same time their cargo has a main advantage: not all paper is in a hurry. It can wait, for example until the Sunday sailing, if we need the freight space for other customers. This flexibility is obviously a main advantage over our competitors. When looking at the freight deck, I see a lot of double-stacked container boxes which I normally expect on deep-sea container ships. What kind of traffic is that? The APM Terminal in the Port of Gothenburg is affected by a long-running conflict of almost two years between the dockers’ union and Maersk, the owners of the terminal. 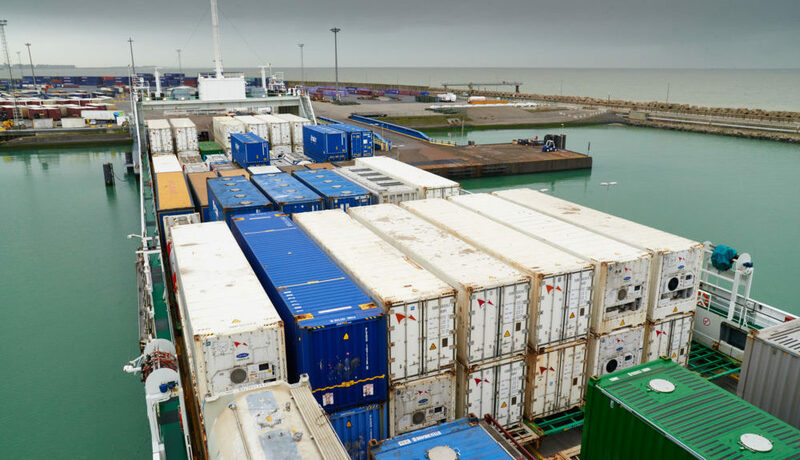 We do benefit from this conflict because some containers are now being shipped via our ships, the PSA hub in Zeebrugge and then via Antwerp, where PSA has three big container terminals. But we normally carry a substantial volume of bulk- and tank containers for inter Europe trade that we also double stack. Let’s talk about the three other routes. Which are they? As a result of the cooperation with StoraEnso, we offer two routes linking Finland to the continent and beyond, since 1 December 2014. From Northern Finland we sail to Lübeck. Also from Finland we sail to Lübeck, Antwerp, Zeebrugge, Tilbury and Oxelundsund (Sweden). In 2015 we made partnership agreements with P&O Ferries, which allowed us to extend our network to the UK. Now freight can be transshipped in to Teesport, Tilbury and even Hull too. For our customers this can be done in one booking. The same applies for our cooperation with Finnlines that we transship cargo to Bilbao with them once a week. SOL Vessel to Zeebrugge, then transshipment on P&O Vessel (except twice a week, when SOL vessel from North Sea Line calls at Tilbury). SOL Vessel to Zeebrugge, then transshipment on P&O Vessel.